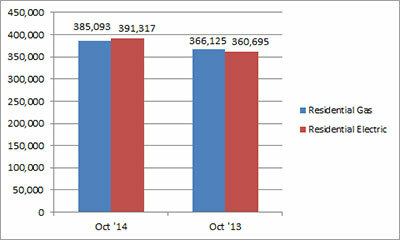 U.S. shipments of residential gas storage water heaters for October 2014 increased 5.2 percent, to 385,093 units, up from 366,125 units shipped in October 2013. Residential electric storage water heater shipments increased 8.5 percent in October 2014, to 391,317 units, up from 360,695 units shipped in October 2013. For the year-to-date, U.S. shipments of residential gas storage water heaters increased 3.6 percent, to 3,664,101, compared to 3,535,503 units shipped during the same period in 2013. 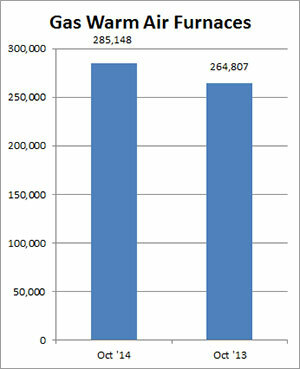 Residential electric storage water heater shipments increased 5.7 percent year-to-date, to 3,521,976 units, compared to 3,330,733 units shipped during the same period in 2013. Commercial gas storage water heater shipments increased 2.9 percent in October 2014, to 7,569 units, up from 7,357 units shipped in October 2013. Commercial electric storage water heater shipments decreased 5.6 percent in October 2014, to 6,498 units, down from 6,883 units shipped in October 2013. Year-to-date U.S. shipments of commercial gas storage water heaters increased 5.6 percent, to 78,944 units, compared with 74,765 units shipped during the same period in 2013. Year-to-date commercial electric storage water heater shipments increased 6.3 percent to 61,976 units, up from 58,320 units shipped during the same period in 2013. U.S. shipments of gas warm air furnaces for October 2014 increased 7.7 percent, to 285,148 units, up from 264,807 units shipped in October 2013. 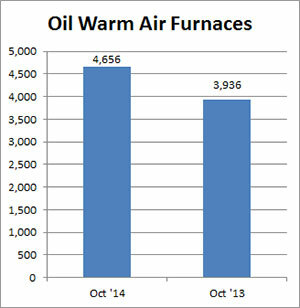 Oil warm air furnace shipments increased 18.3 percent, to 4,656 units in October 2014, up from 3,936 units shipped in October 2013. Year-to-date U.S. shipments of gas warm air furnaces increased 5.2 percent, to 2,203,327 units, compared with 2,093,889 units shipped during the same period in 2013. Year-to-date U.S. shipments of oil warm air furnaces increased 7.9 percent to 26,535, compared with 24,593 units shipped during the same period in 2013. U.S. shipments of central air conditioners and air-source heat pumps totaled 433,643 units in October 2014, up 19.3 percent from 363,465 units shipped in October 2013. U.S. shipments of air conditioners increased 15.1 percent, to 280,524 units, up from 243,692 units shipped in October 2013. 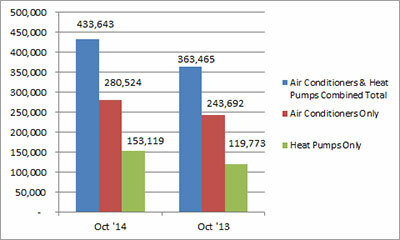 U.S. shipments of air-source heat pumps increased 27.8 percent, to 153,119 units, up from 119,773 units shipped in October 2013. 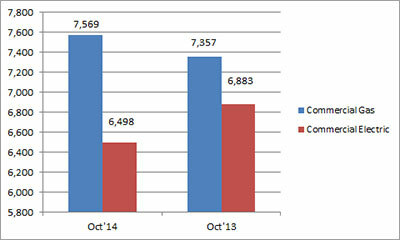 Year-to-date combined shipments of central air conditioners and air-source heat pumps increased 8.9 percent, to 6,033,336 units, up from 5,540,374 units shipped in October 2013. Year-to-date shipments of central air conditioners increased 4.9 percent, to 3,993,768 units, up from 3,807,527 units shipped during the same period in 2013. The year-to-date total for heat pump shipments increased 17.7 percent, to 2,039,568 units, up from 1,732,847 units shipped during the same period in 2013.